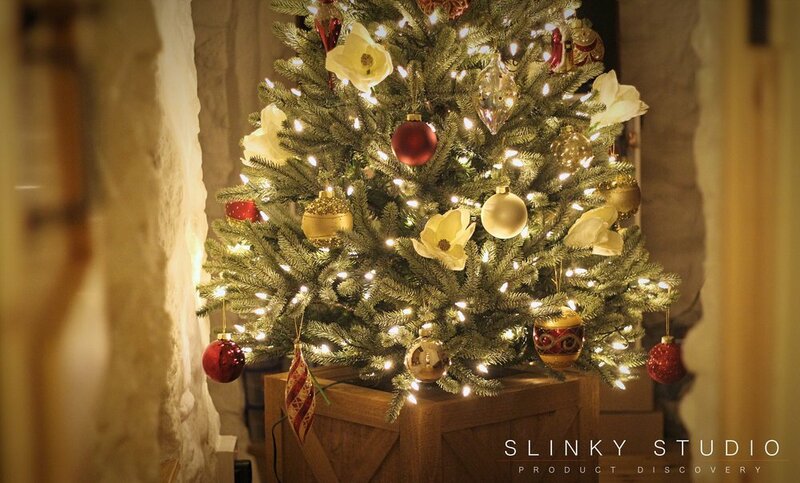 The official countdown to Christmas is almost upon us, so we’ve put together a bundle from the master makers of realistic artificial trees, Balsam Hill. We're showcasing their latest decorative pieces centred around their Royal Blue Spruce Christmas Tree Candlelight version, which is an ideal choice for reasonably compact areas. Found within the box are instructions, a stand, two pairs of gloves, a transformer plug for the LED lights, spare bulbs plus a tool to change them and a storage bag. We didn’t use the supplied stand but instead have the new £179 Balsam Hill Rustic Wooden Rolling Tree Stand. This tree stand has the unique feature of sitting on castors to allow for easy movement of the tree's position both before it’s decorated and when in use. It came in particularly useful, as we wanted our tree centred between an archway and window, and realised we didn’t quite have it right in the first instance. We slotted the first trunk section of tree into the wooden stand and tightened it in place with eyebolt screws. Then we popped on the ever so comfortable gloves for arguably the most important part of the assembly process, which is shaping the tree. As suggested by Balsam Hill, we found that by working with a section at a time and shaping the tree from the bottom to top, we were able to gain a dense looking tree from every angle. We would stress that this part of the setting up is well worth dedicating time to, because there's a large number of branches on every level and the way they splay is fundamental to the overall look. The Easy Plug technology, utilised in all pre-lit Balsam Hill trees like ours, makes connecting the trunk sections blissfully simple. Just pop each section into the one below and that’s it. There’s no eyeing up a connector or attaching a separate cable; it’s plug and play. We chose the £179 Noel Glass Bauble 35 piece set, the unique £69 Ivory Magnolia Picks, and as an accent for our Royal Blue Spruce tree, in our open plan area we have a £199 Winter Birch Twig Tree to keep the Christmas magic flowing. Notably the Noel Glass Baubles are a beautiful collection of hand painted pieces, with a classical theme thanks to the use of golds, silvers and reds as primary colours within a uniquely shaped and styled collection. Arranged on the tree against the LED candlelights, they look exquisite. Our favourites are the Santa on sleigh and the gold and red patterned textured baubles. Additionally the Ivory Magnolia Picks, which take a little prepping to shape their petals, add a charming delicate warmth to the Blue Spruce. However, our best-loved decorative piece, when viewing the finished tree, has to be the previously mentioned Rustic Wooden Rolling Tree Stand. 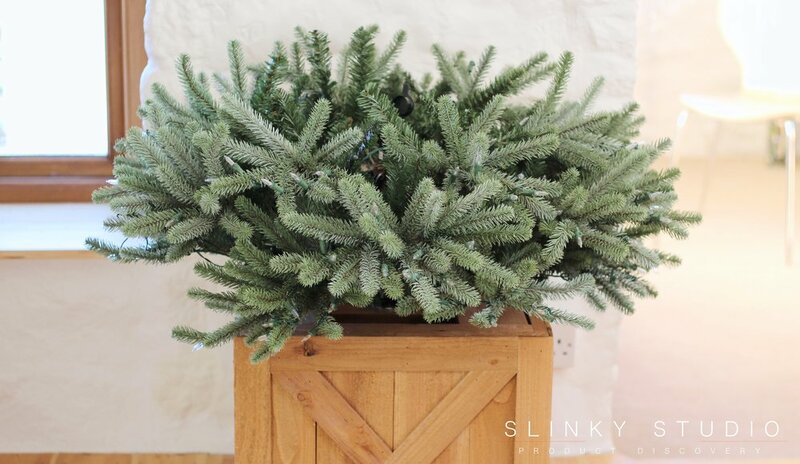 Holding the tree 17” off the ground, this hardy solid wood crate is a wonderful focal point that aesthetically marries so well with our wooden floor where it is positioned. Out of season it will make an ideal place within which to store decorations. Lastly in our Christmas studio showcase, there’s the 4’ Winter Birch Twig Tree. We’ve used lights similar to this for years to place as accents in rooms, but the Birch Tree is definitely the brightest and most captivating of them all. Placed in front of a window on its first night, we soon realised this is one decoration we won’t be putting away after Christmas - it can certainly be used all year round and makes a beautiful mood lighting solution for use during the evenings with its 6hr timer. It gets better though: this Birch tree can be used outdoors too, so ours is living a hybrid life indoors and outdoors on a wooden veranda. It is supplied with a power cable generous enough in length and thin enough to place discreetly under doors. First and foremost the LED Candlelights are something we’d always opt for on Balsam Hill trees. A plentiful quantity exude a twinkly mysticism that doesn’t cease to be a joy to see every day. The Blue Spruce is a dense tree, having a bushier appearance than the more traditional Fraser Fir tree we showcased last year. For this reason it has a bolder stance despite boasting a narrower profile (38” with ours) on a height to height basis. This is one of the reasons we opted for the 5’ £359 Royal Blue Spruce, as we wanted a Christmas tree that suited and fitted within a heavily people trafficked area, and it has done so perfectly. It’s a very sensible option for bedrooms, dining areas and even smaller living spaces. But the real magic of the Balsam Hill Royal Blue Spruce is how it interacts with the changing lighting conditions throughout the day. Despite its name, this is a tree with warmth in the evening, although it does exhibit a cooler appearance as the sun passes over in the day - just like the real thing. Notably nothing about this tree looks at all like the waxy and uninspiring artificial trees you see in stores. 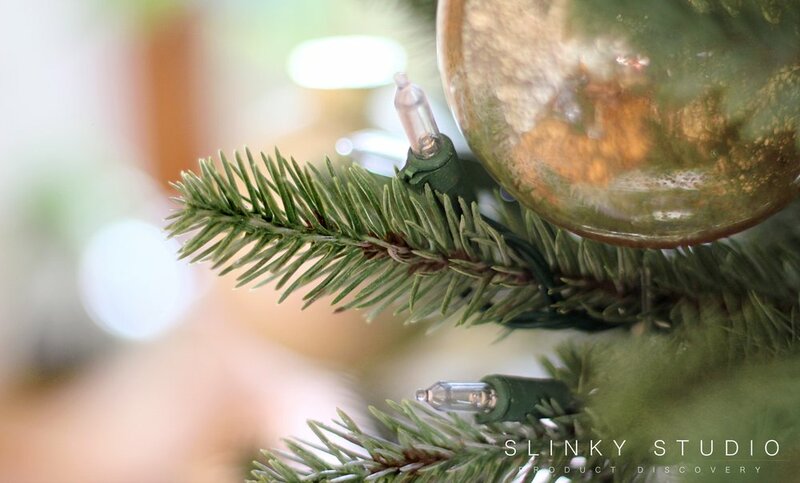 The Blue Spruce’s unique branch colours, brown stems and intricate needle detail appear and feel like the real thing, with what Balsam Hill refer to as True Needle technology. This tree has a natural character and charm, leaving both ourselves and our guests unable to distinguish the difference between it and the real spruces we see outdoors. The Royal Blue Spruce is a charming Christmas tree for more compact areas where you don’t want to sacrifice the genuine plump look of a real tree. Our 5ft variant captures realism through its remarkable detailing and the enjoyable subtlety of the branches gradually adapting in shade from day to night. It’s a wonder to behold with its rustic wooden tree stand and twinkly lights that glisten against the exquisitely fashioned glass ornaments.